Adding Sites to Your Browser's "Trusted Sites"
3. You will see a pop-up window. Select the Security tab. 4. Select the Trusted Sites icon. a. Uncheck the box to require server verification. b. 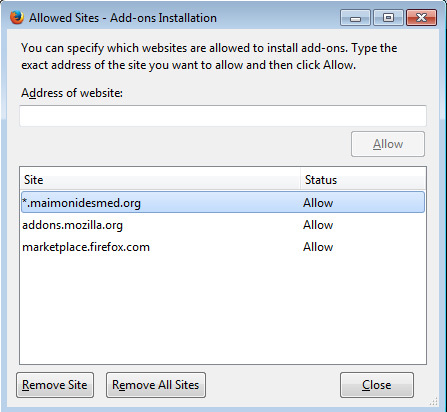 Add "*maimonidesmed.org" to the zone. 1. Open Firefox internet browser. 2. On the top right hand side area on the browser click the FIREFOX BUTTON that will then show a drop down menu. 3. 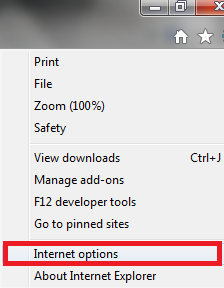 Open Firefox Options and click the SECURITY TAB at the top. 5. 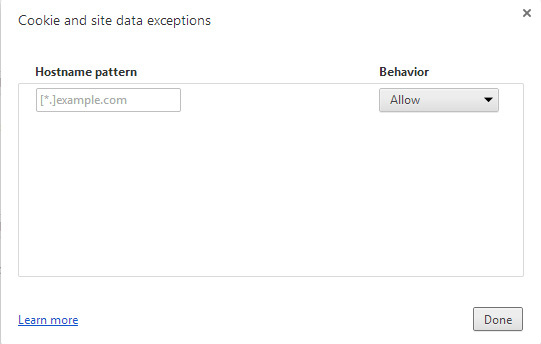 Within the Security Tab click on the first (top) EXCEPTIONS BUTTON. 6. This opens the list of sites that you are "trusting" to allow access to. 7. Next click within the "Address of website:" field and type in the base of the website address in which you are tying to work. 10. The site should now be shown in the SITE area. 2. On the top right-hand side of the browser click the CUSTOMIZE AND CONTROL GOOGLE BUTTON. 4. This will open a menu -> find and open the SETTINGS option. 5. This opens the SETTINGS screen. 6. Scroll down to the bottom of the page and CLICK the link "SHOW ADVANCED SETTINGS". 7. Continue to scroll down the page slowly until you see the PRIVACY area. 8. Under the PRIVACY area click one "CONTENT SETTINGS". 9. This will open a dialogue box in front of the Settings area. 11. In the HOSTNAME PATTERN field type in the base of the website address in which you are tying to work. 13. Verify that the "BEHAVOIR" is set to ALLOW and click Done.